(Newser) – India's goal to increase its forest cover to 235 million acres in the next 15 years has gotten a big boost. On July 11, more than 800,000 people in Uttar Pradesh state planted nearly 50 million saplings in 24 hours in a bid to set a new Guinness world record, Popular Science reports. The figure has yet to be certified, as National Geographic notes, but if it is, it will trounce the previous record of 847,275 trees set by Pakistan in 2013. 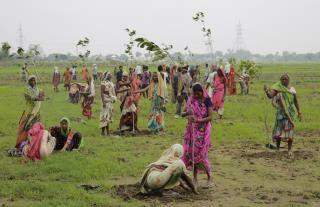 India has reserved more than $6.2 billion for tree-planting initiatives in all of its 29 states, the AP reports. The effort stems from commitments made at the 2015 climate change summit in Paris. “The world has realized that serious efforts are needed to reduce carbon emissions to mitigate the effects of global climate change,” says one official from Uttar Pradesh. I THINK that I shall never see A poem lovely as a tree. A tree whose hungry mouth is prest Against the sweet earth's flowing breast; A tree that looks at God all day, And lifts her leafy arms to pray; A tree that may in summer wear A nest of robins in her hair; Upon whose bosom snow has lain; Who intimately lives with rain. Poems are made by fools like me, But only God can make a tree. TREES by Joyce Kilmer. 1886–1918 There ya go ALL!! Way to go, India! Way to go Pakistan! I realize this sort of news is boring. However, it shows that, possibly, the majority of the people in this world are decent human beings.